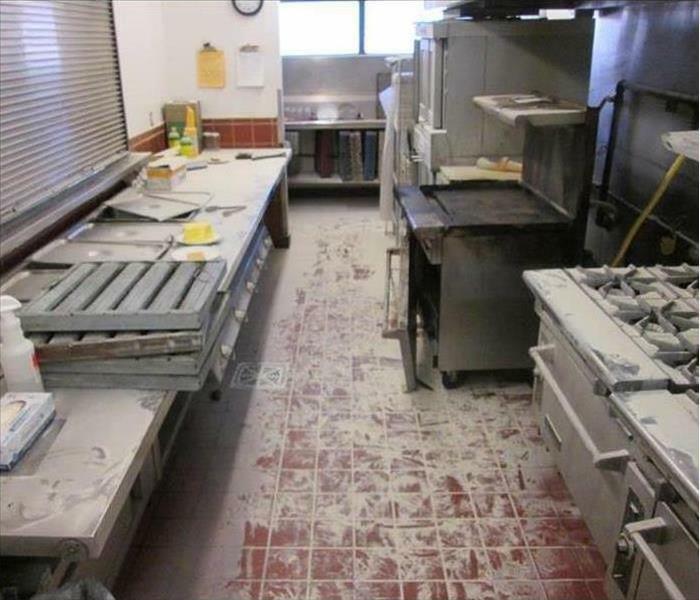 Commercial fire damage was suffered at this Marlborough restaurant’s kitchen. 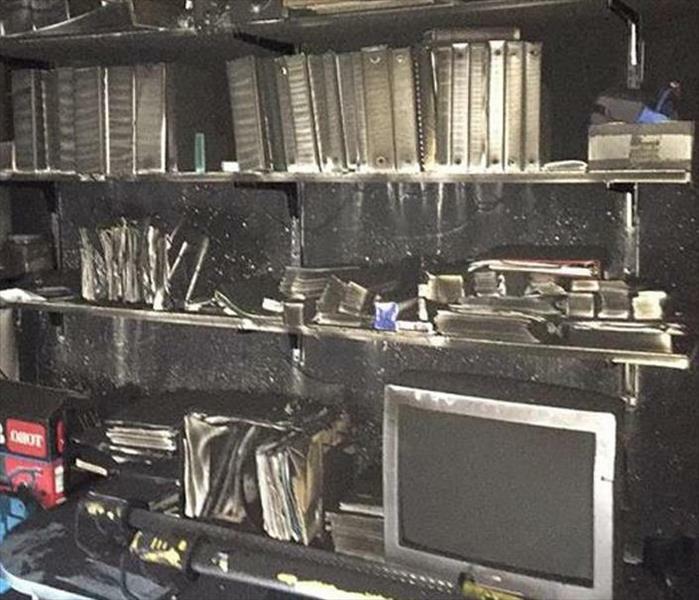 Installed fire suppressant systems extinguished the fire, but not before a layer of soot and smoke damage covered all the appliances counter tops, and floors. SERVPRO of Marlboro / Concord has the equipment and trained personnel to handle situations just like this. 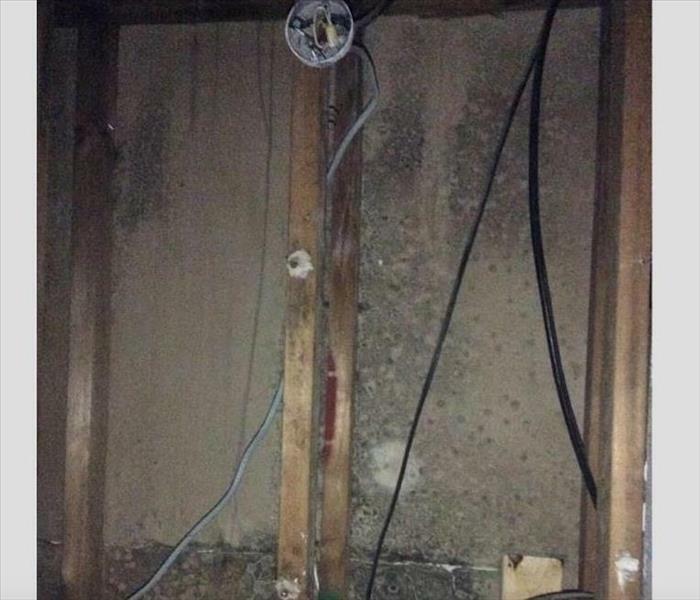 Moisture has penetrated the drywall of this home. As a result, the drywall had to be removed in order to be able to remove mold growth from the studs. 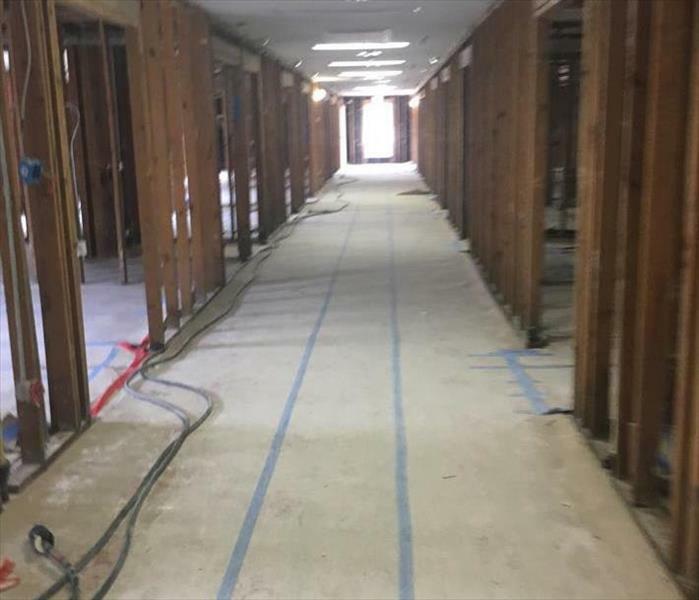 After the area is thoroughly dried, wood materials must usually be sanded to a specified depth and then sealed so as prevent new mold growth from recurring in the future. Leaking plumbing is one thing, but a leaking pipe in the bathroom creates a potentially hazardous mess. SERVPRO Franchise professionals have the training and equipment to safely remove water from your bath and restore it to the preloss condition. You can trust the SERVPRO Brand to make it "Like it never even happened." Condominium living is nice except sometimes damage from neighboring units can affect yours. 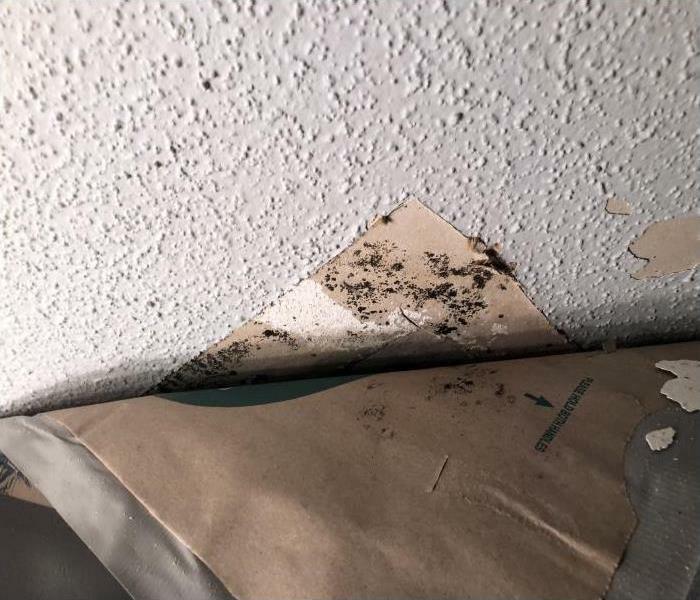 In this case, a leak from a water supply line in the unit upstairs and caused a slow drip into the ceiling of the unit below resulting in mold. 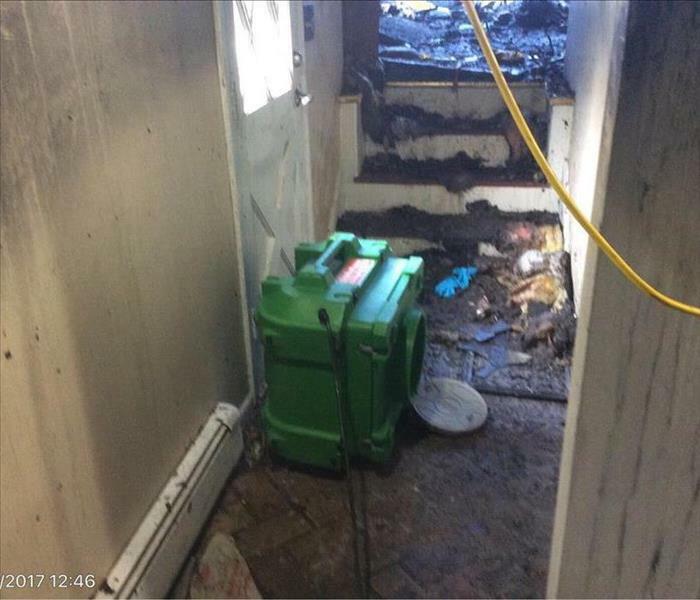 SERVPRO was able to remediate the damage and make it "Like it never even happened." When the bathroom in the upstairs apartment leaked, the bathroom below suffered damage as well. 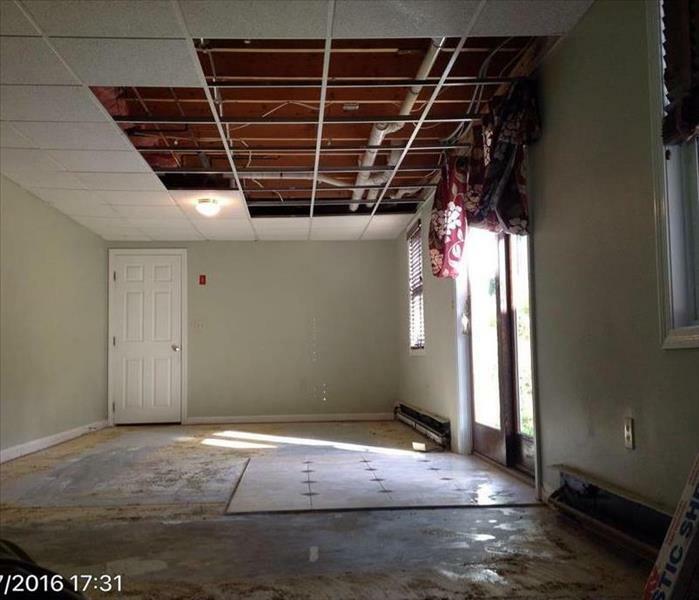 The ceiling and the walls had water damage and our team was called in to remediate. The customer was very satisfied with the results. Should your home have water damage that stems from another unit or another room, contact our certified and experience team right away! We make it "Like it never even happened." 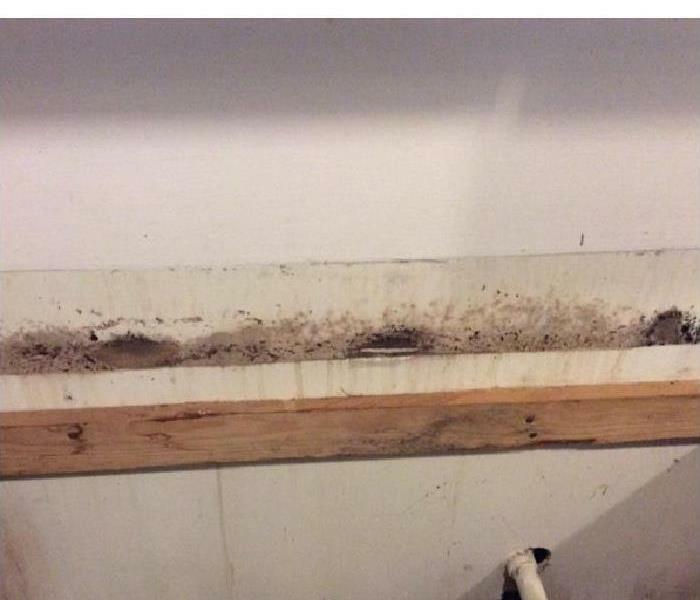 Slow leaks can create ideal conditions for mold growth. This Westford homeowner had a slow leak in her sink faucet which caused mold to grow in the basement. SERVPRO first stopped the leak, dried out the materials, and then removed the mold. Since mold damage was involved, we built temporary containment barriers so that the mold spores would not travel to other areas of the home. The homeowners were pleased with the results. Call SERVPRO to remove mold from your home. 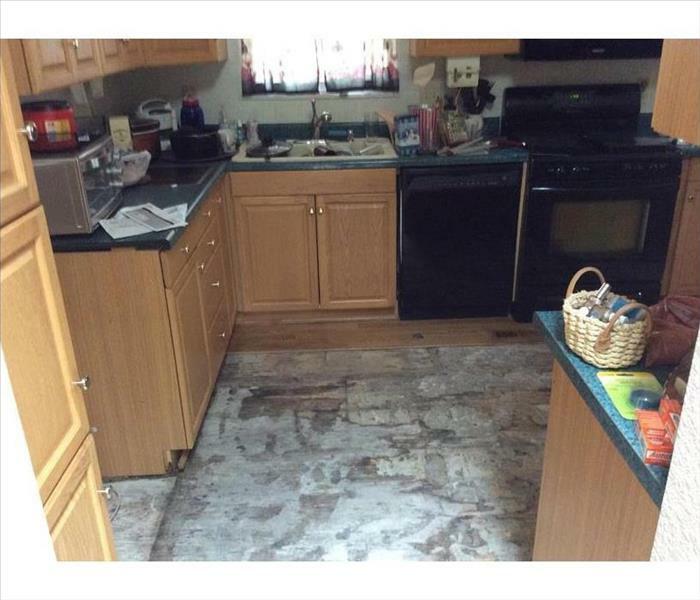 Mold was found in this Westford kitchen, under the flooring. SERVPRO of Marlboro / Concord technicians removed the flooring to get to the source of the mold so that they could effectively remove all of the contents of the affected area. 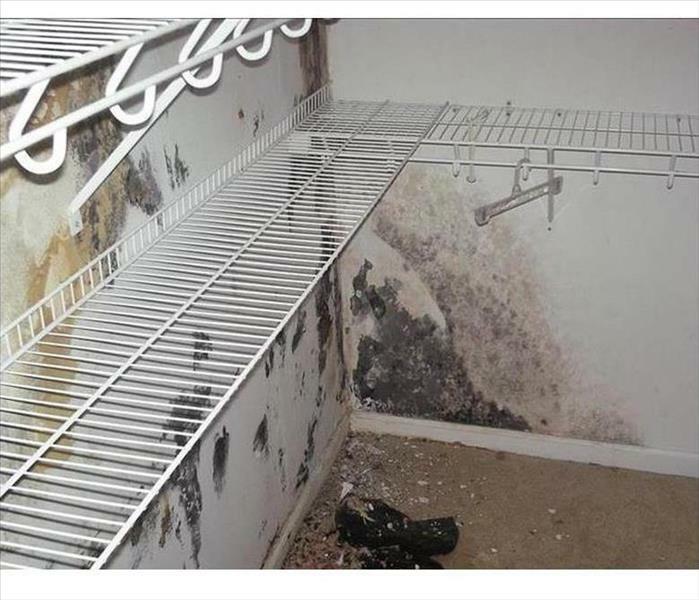 Mold can spread quickly and cause a great deal of damage but luckily, our trained team knows just how to remediate the damage and what steps to take to help prevent a recurrence. Contact us when facing mold and we'll make it "Like it never even happened." When a pipe bursts in your finished basement, there is the potential for flooding to ensue. Quick removal of any standing water is the remedy and can also help prevent any secondary damages. 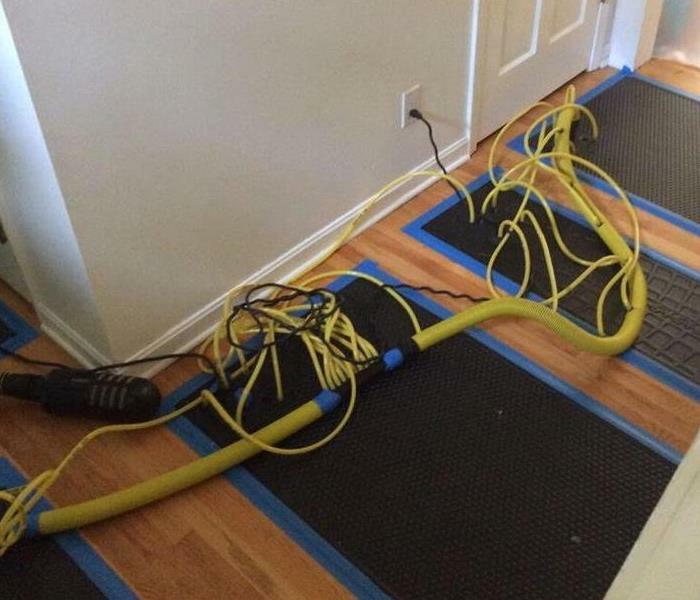 If your home is facing such a scenario, contact our SERVPRO team right away at (978) 486-9868. Leaking faucets that are not caught immediately always create problems for the homeowners. 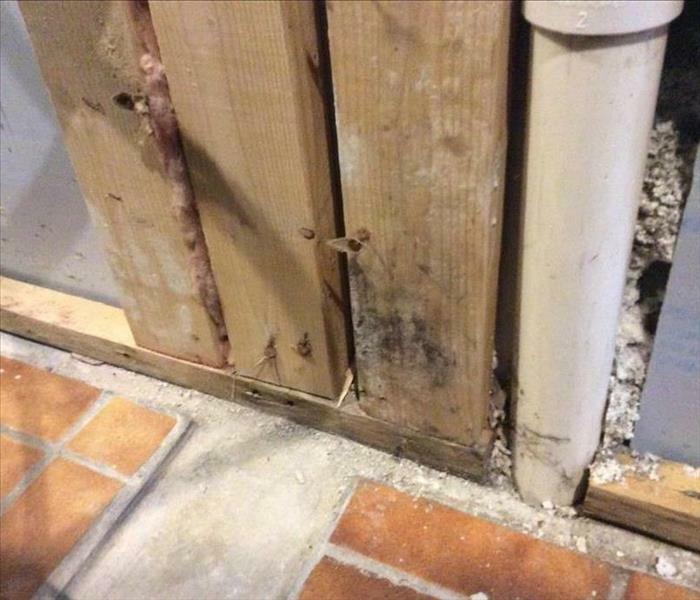 When that happens, both water damage and mold are usually the result. 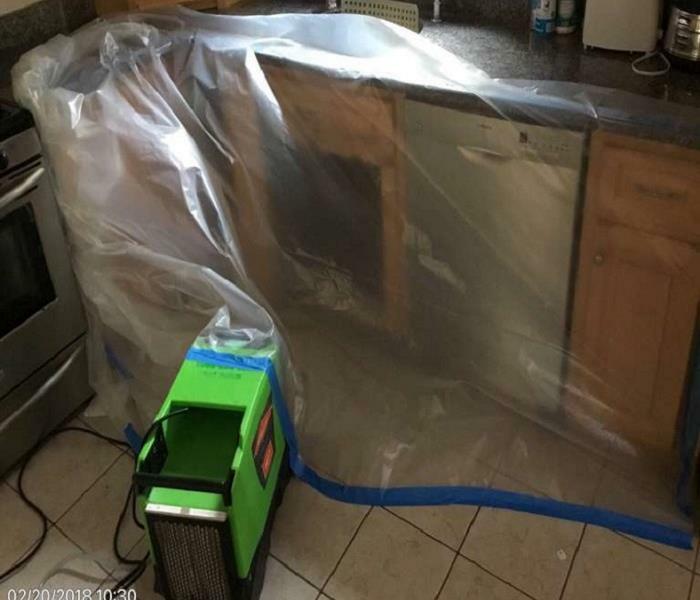 Your best recourse in this type of situation is to contact SERVPRO for effective water damage and mold remediation services at (978) 486-9868. Long after the flames are extinguished, the damages of fires remain. One type that is particularly difficult to clean is soot damage. You can see the outlines on the carpet of where furniture and other items were during the fire. SERVPRO has the equipment and special cleaning agents to remove the stains and get your house back to "Like it never even happened." Our specialists received a call regarding a water damage disaster at a home in Natick. A leaky pipe in the upstairs bathroom caused significant damage to the dining room ceiling. Our experts acted quickly to prevent further damage and possible mold growth. We used a containment process to stop the water from spreading. Our technicians were able to restore this home to pre-damage condition using our training and advanced equipment. 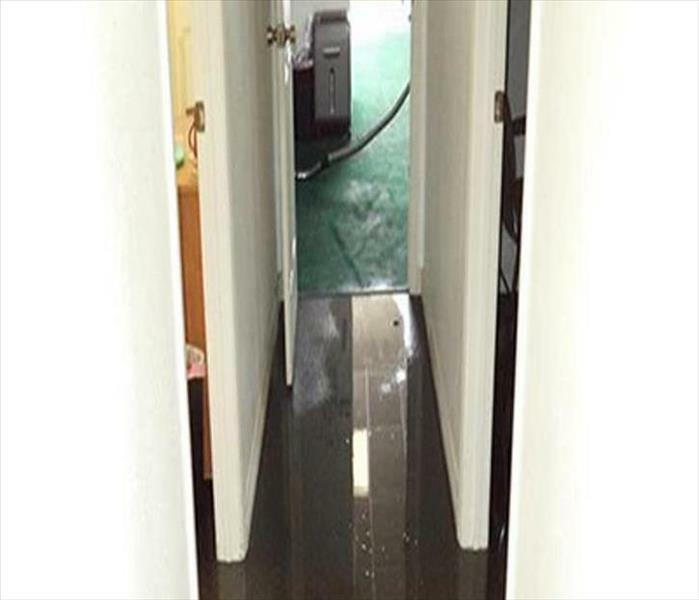 When water strikes your home, the team to call is SERVPRO of Marlboro / Concord! 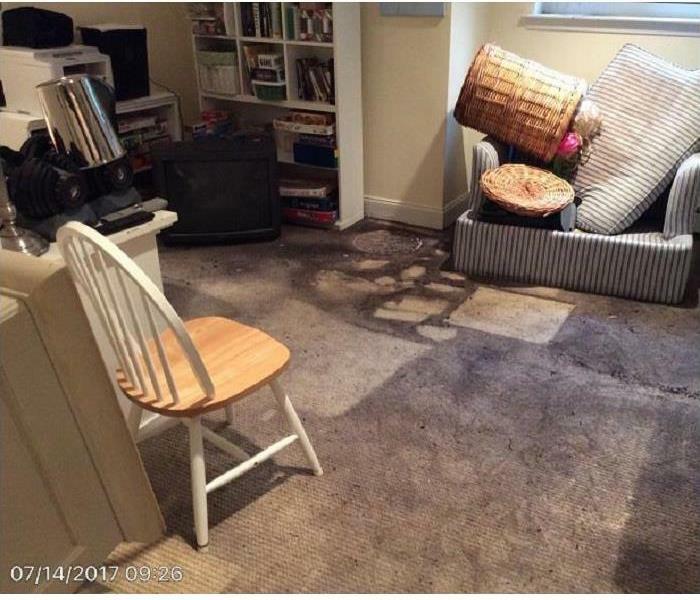 This basement flooding from a faulty toilet ruined the carpet and wicked deeply into the walls in this Westford residence. Our SERVPRO crew responded quickly, assessed the situation, and removed the carpeting and the flooring. 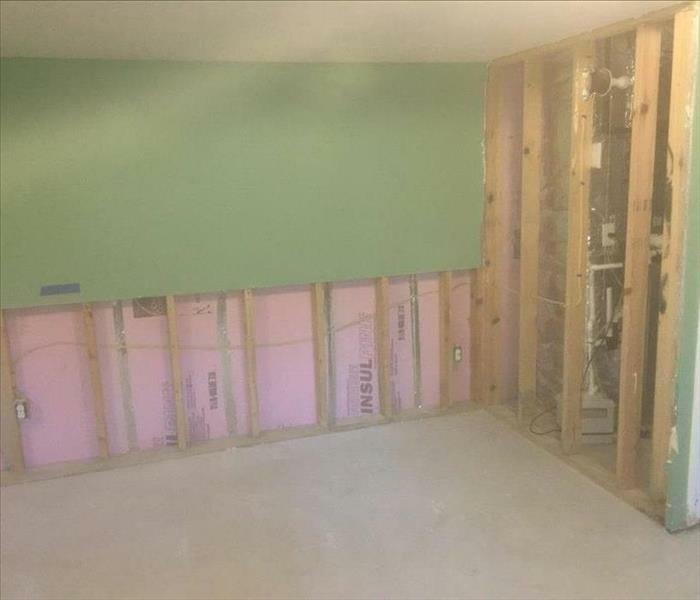 We did a "flood cut" to minimize the demolition to the non-salvageable lower section of the drywall. Our advanced water removal and drying equipment mitigated the damage and secured the house for our customer. Littleton homeowners know why to call SERVPRO for cleaning up after renters have vacated a house. 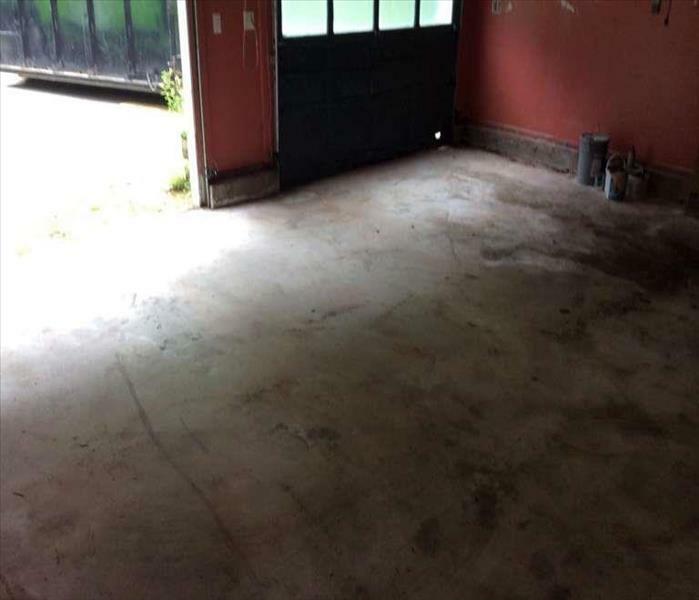 We have experience, the equipment, and the formulated products to sanitize and deodorize once the basement appears as it does in this Photo. 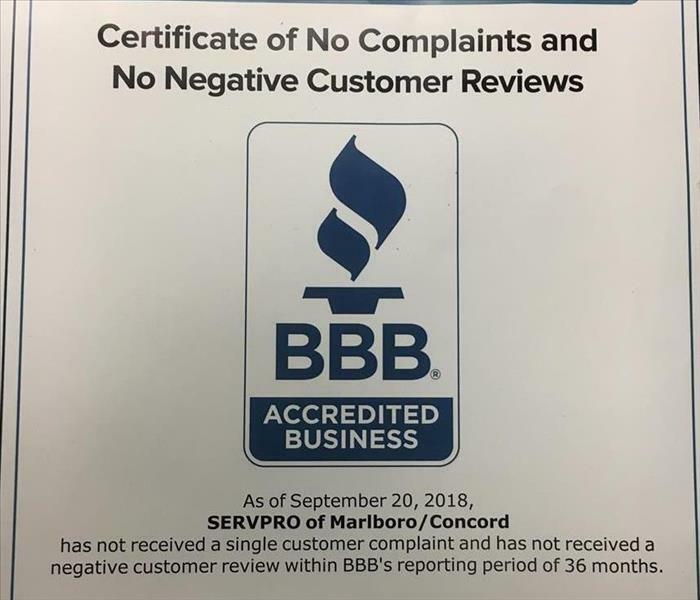 SERVPRO of Marlboro/Concord has been an accredited business with the Better Business Bureau since 2014 and has not received any complaints or negative reviews since then. We are very proud to have this certificate. A water leak, then a mold infestation that spread throughout the sheetrock, then a call to SERVPRO. This is the best process for remediation in your Littleton property. 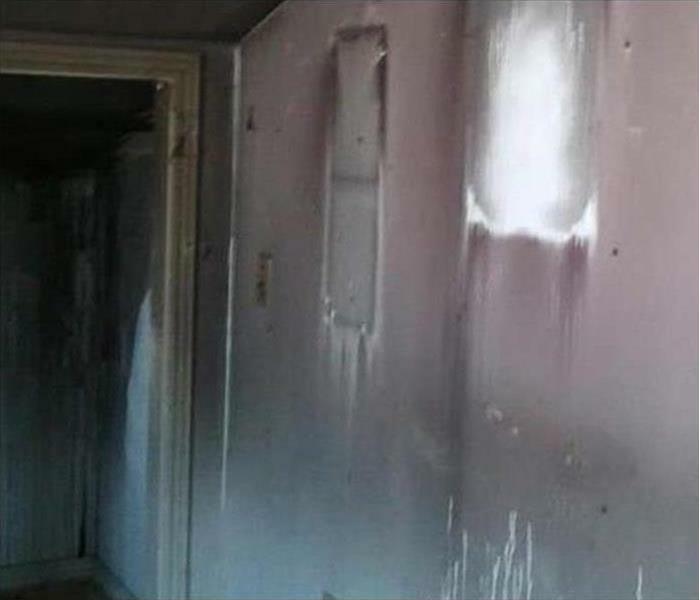 A neat, controlled demolition, application of an antimicrobial spray, and an assurance that the affected area is ready for a rebuild. Get it done right! A SERVPRO technician is decked out in PPE personal protection equipment during the removal of insulation from this building in Chelmsford. 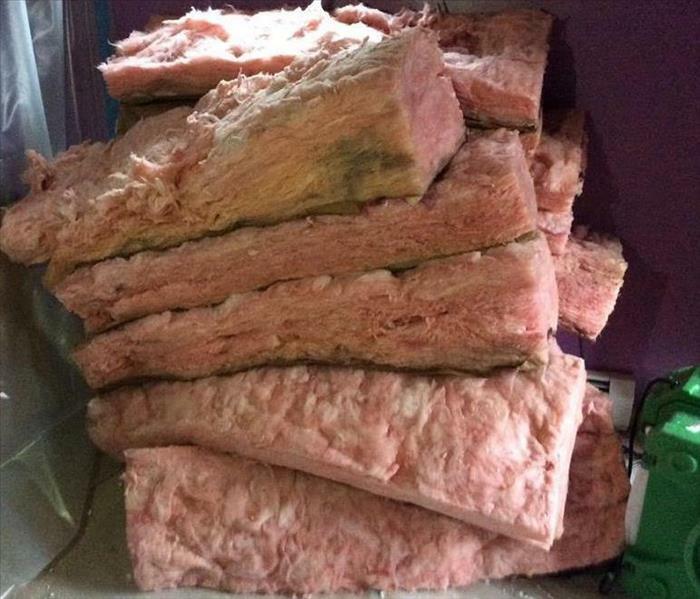 There was wet insulation from a water leak in the attic that needed to be removed. 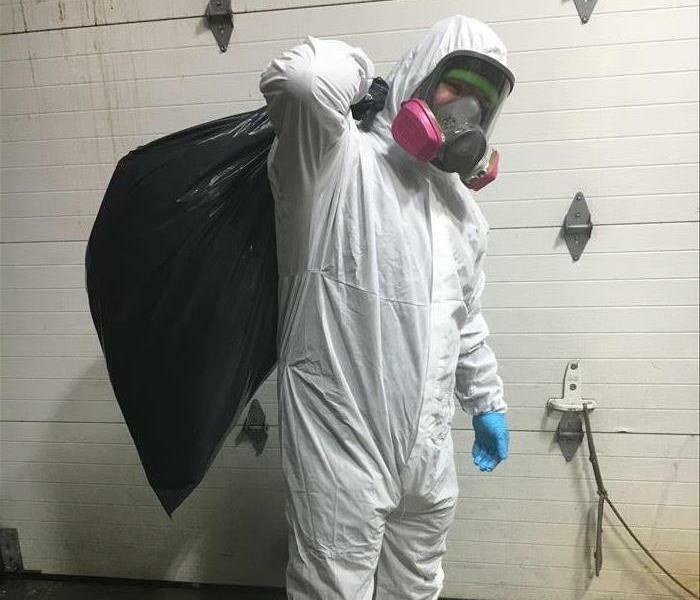 Count on us to secure your property during an asbestos abatement job. This is an excellent example of what can happen to older carpet, or carpet that has remained wet for an extended period. It is called delamination, and it is where the glue that holds the backing onto the carpet weave has dissolved and the backing is literally falling off of the carpet. 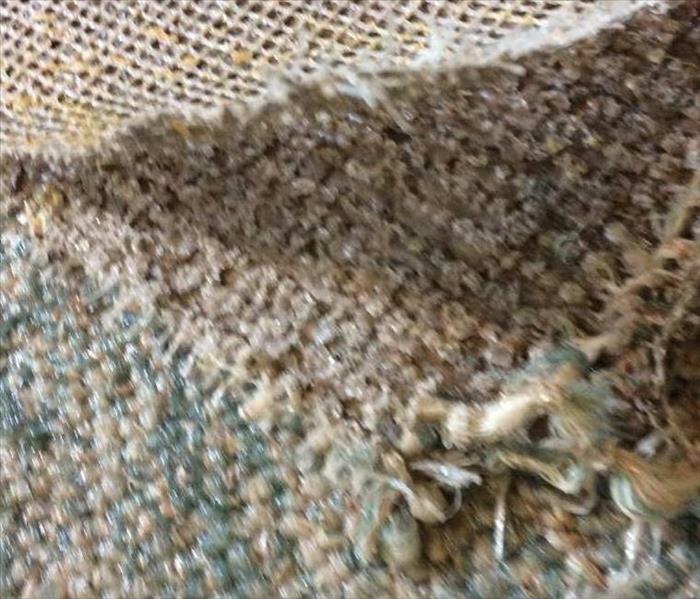 When attempting to extract water or dry carpet like this it can actually disintegrate while you are working with it, so it must be replaced. 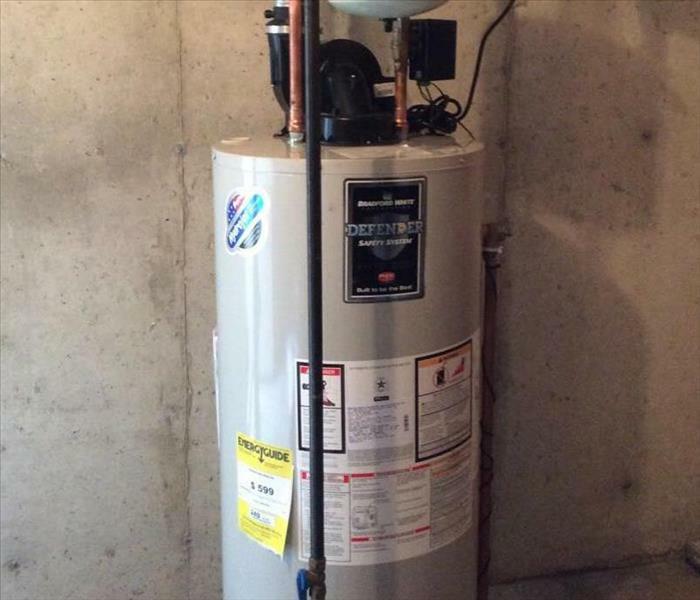 Team SERVPRO of Marlboro / Concord ran into this situation at a residence in Westford, MA. The upstairs toilet had overflowed causing a flooding in the basement with standing water. The crew came out and took out the damaged carpeting. 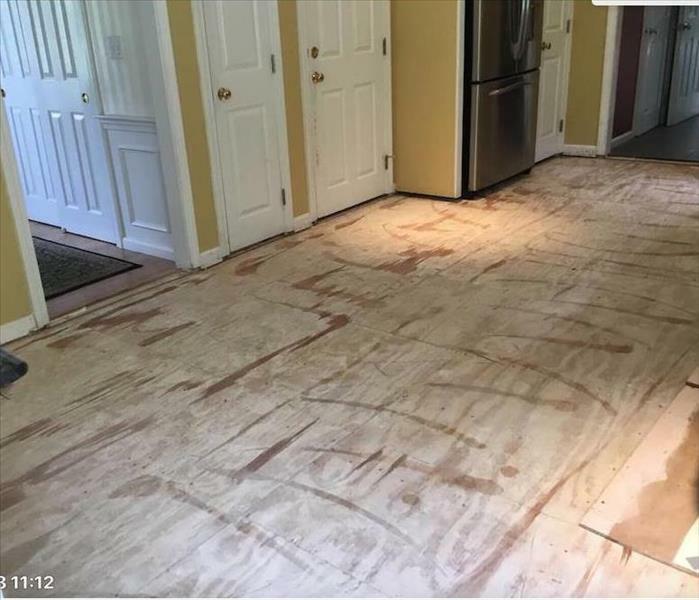 They removed the flooring to get to the water damage. Our crew used high tech equipment to clean up the water. 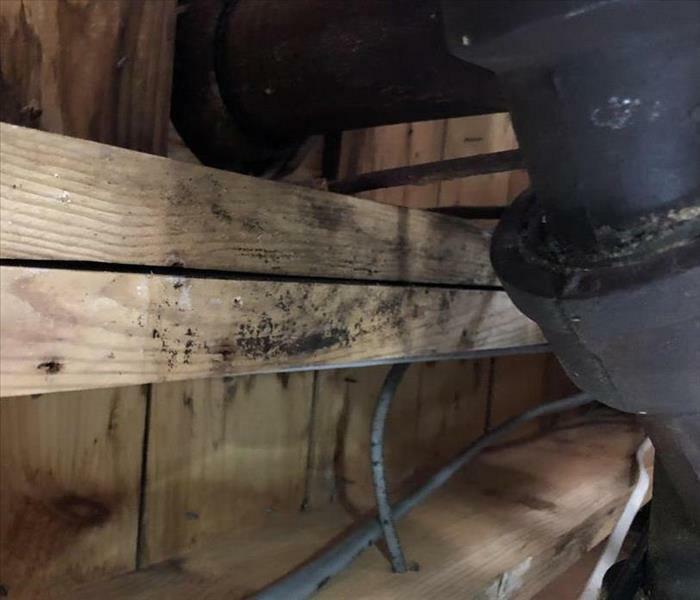 Water damage occurred to this Marlborough Home when a leak under the sink spread along the floor until it affected the hardwood flooring in the hallway. 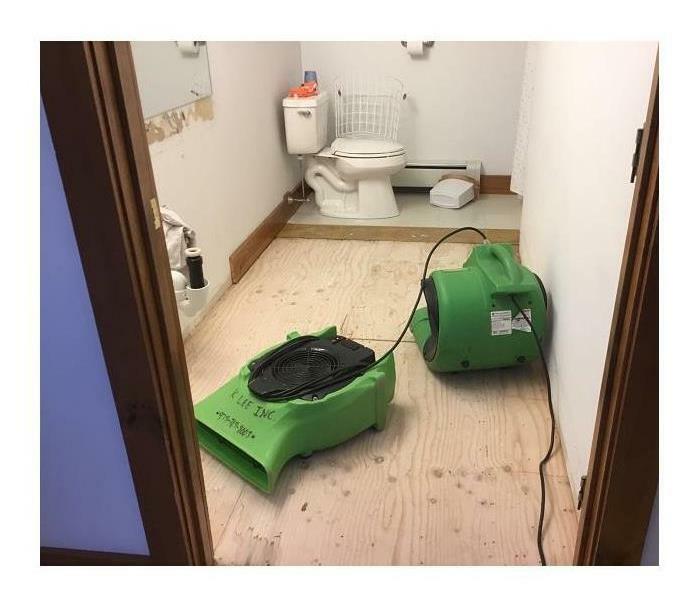 When the SERVPRO of Marlboro / Concord technicians arrived to clean up the water affecting the hardwood floors they discovered that the water had traveled through the subfloor and into the basement. Our crew extracted the water and removed the mold for the customer. 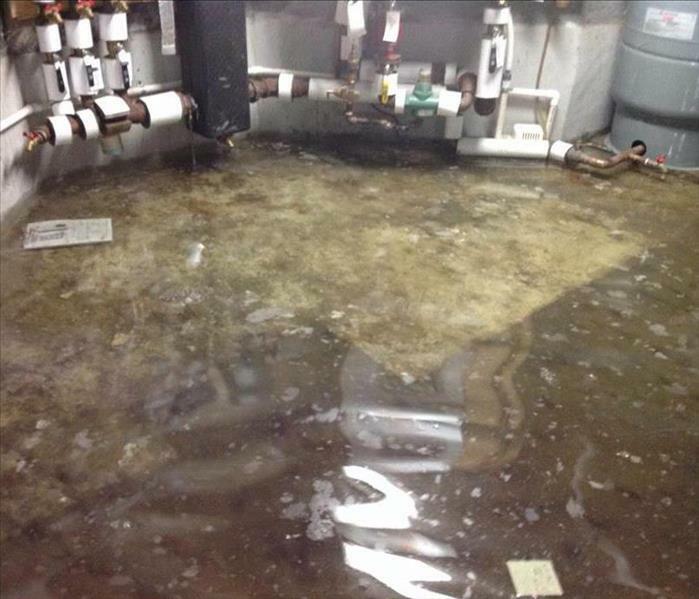 A ruptured water line, even when quickly shutoff, can quickly cause water damage to structures in a Concord commercial building. 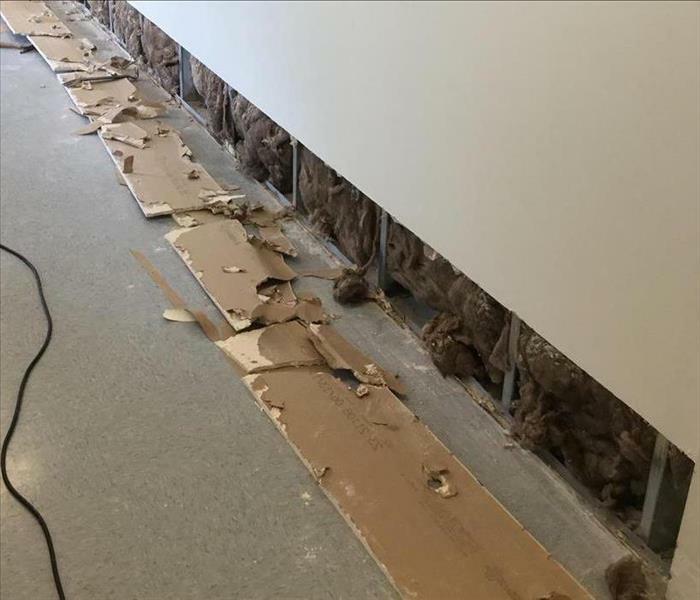 SERVPRO technicians often use what we call a "flood-cut" to remove soaked drywall, prevent on-going water wicking, and minimizing the new materials needed for the rebuild. The opening exposes the galvanized steel studs for drying to prevent rusting and to extract the moisture and salvage the damaged insulation. The fire damaged some materials in this Acton garage. SERVPRO technicians can follow the firefighters to remove any water and moisture. Then the cleanup and demolition can continue to restore this area to a condition ready for rebuilding the wall. During renovations and remodeling in office buildings, the accumulation of debris and refuse from torn out materials need removal. 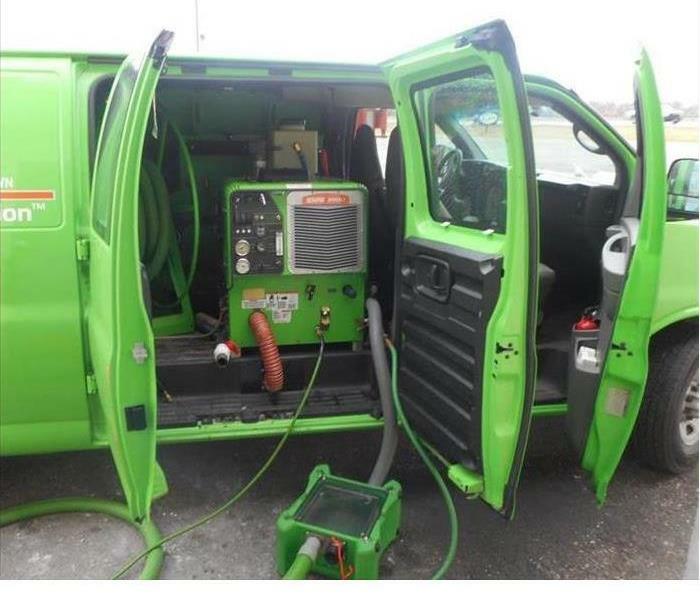 SERVPRO of Marlboro/Concord has the industrial grade equipment manned by highly skilled technicians to satisfy clients and keep on schedule. 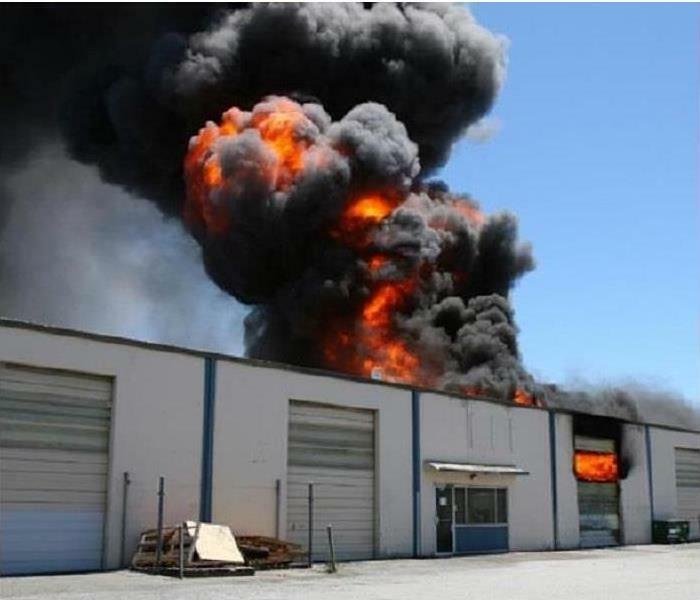 Call us for water, fire, mold, and many more services for your commercial structure. The lifted vinyl wallpaper reveals the hidden mold colonies in this Marlborough house. Dampness from a poorly sealed exterior door allowed sufficient moisture to absorb from the carpet and baseboard to wet the wall. And the result is a mold remediation service to restore a preloss condition to this property. 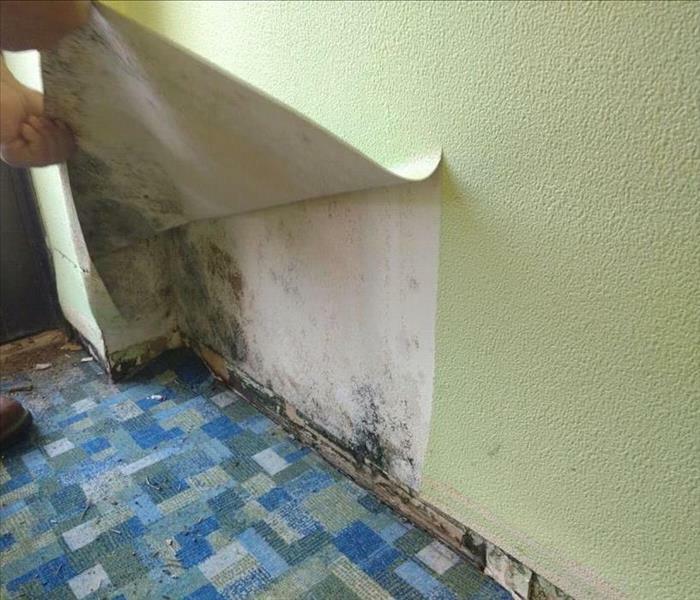 SERVPRO has many years of experience in dealing with just this sort of mold proliferation. 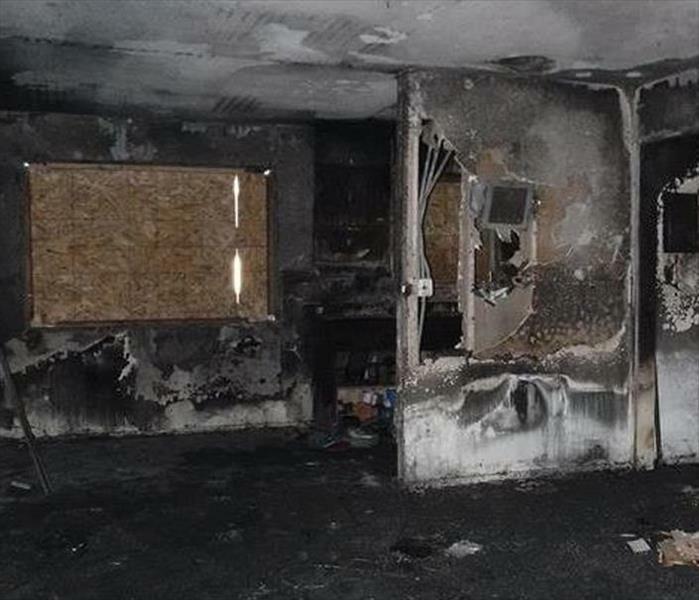 Vandals torched a property in the Littleton area, and it required a fire damage cleanup without a restoration service. In a case like this SERVPRO can organize and control the demolition and removal of debris to allow for the future renovation. 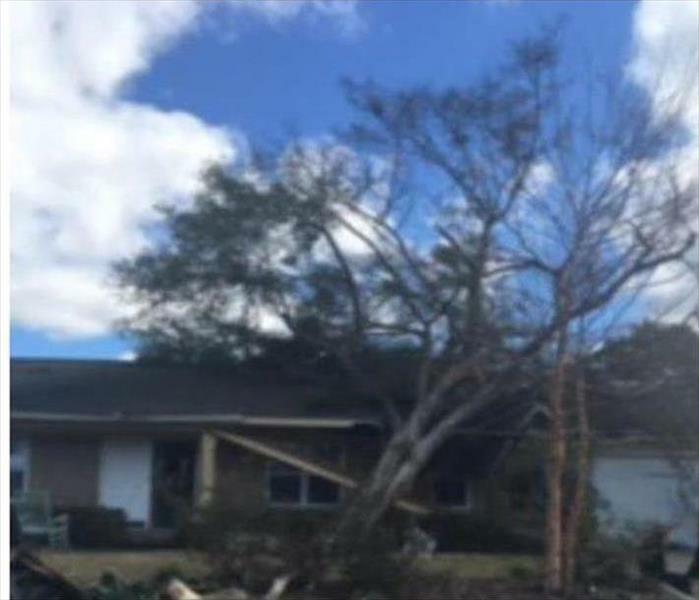 Strong, straight-line winds can cause havoc to commercial sites in Concord disrupting business. When work is at a standstill, client fulfillment goes unanswered. 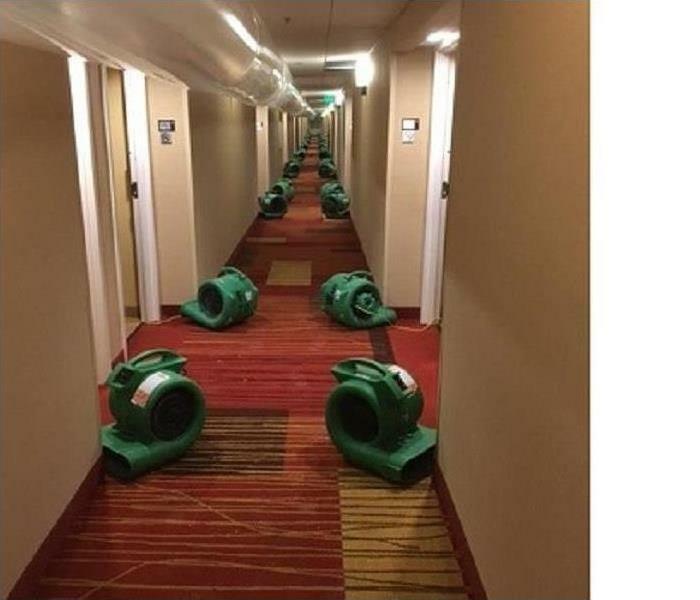 Rely on SERVPRO to quickly help clean up the storm-damaged interior and get our office humming once again. The absence of light, poor circulation, and insulation can lead to mold growth in a Concord basement. 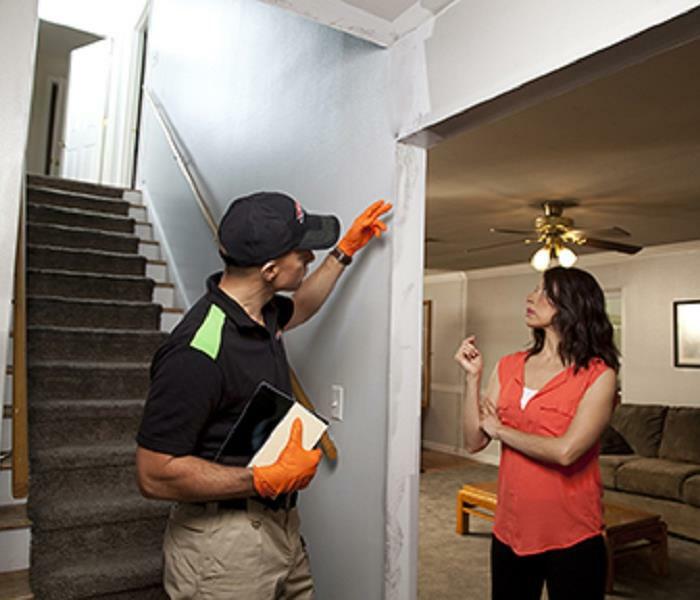 By calling SERVPRO, you get the best in the business for mold remediation while safely securing the unaffected areas of your home. We are prepared & motivated to take on every challenge that presents itself. SERVPRO of Marlboro/Concord can accommodate restorations going from small spaces, to large commercial buildings. Our franchise has been operational since 1998, gaining our customers trust through hard work and dedication. There's no job that's too big, we do it all! 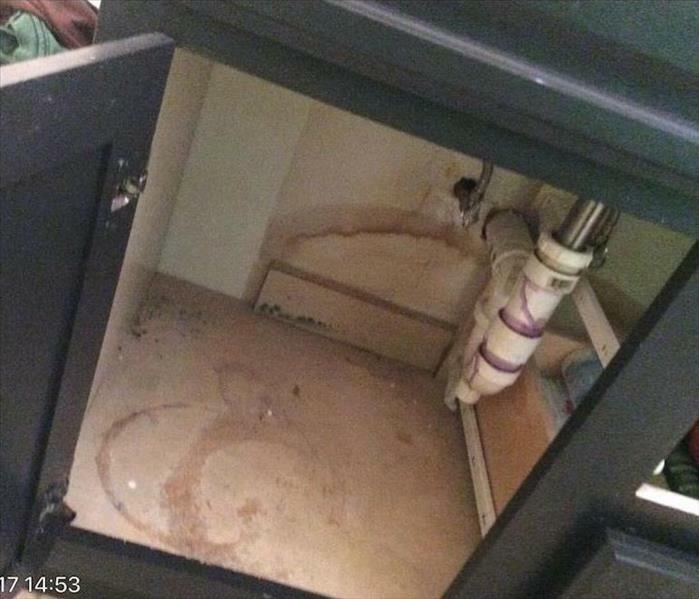 After a leak has infiltrated under a linoleum floor in a Marlborough kitchen, the course of action is to remove the covering to dry out the floor and prevent secondary water damage to the cabinets and appliances. Call SERVPRO for a fast resolution to your problems. 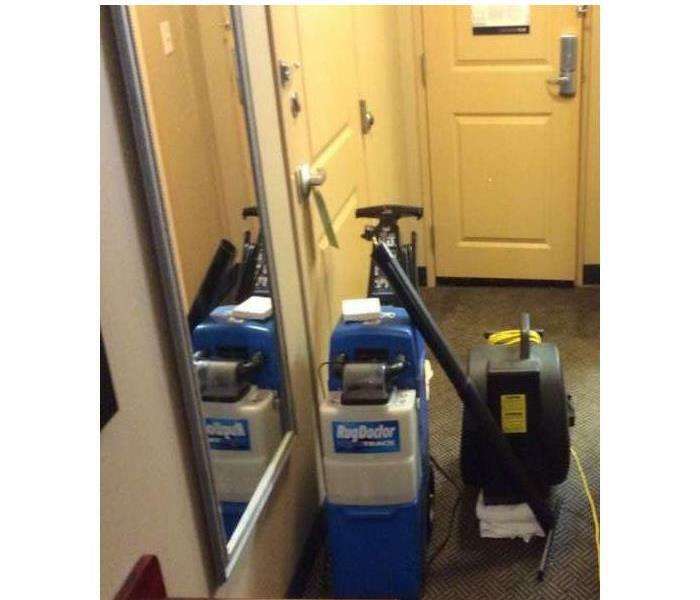 The photo listed shows the ultimate carpet cleaning system that SERVPRO of Marlboro/Concord used inside of a Hotel, after they just experience a massive water loss on all of the floors. This product eliminates, dirt, grim, germs and anything else that resides in your carpet that you don't know about. This system delivers true professional cleaning results. 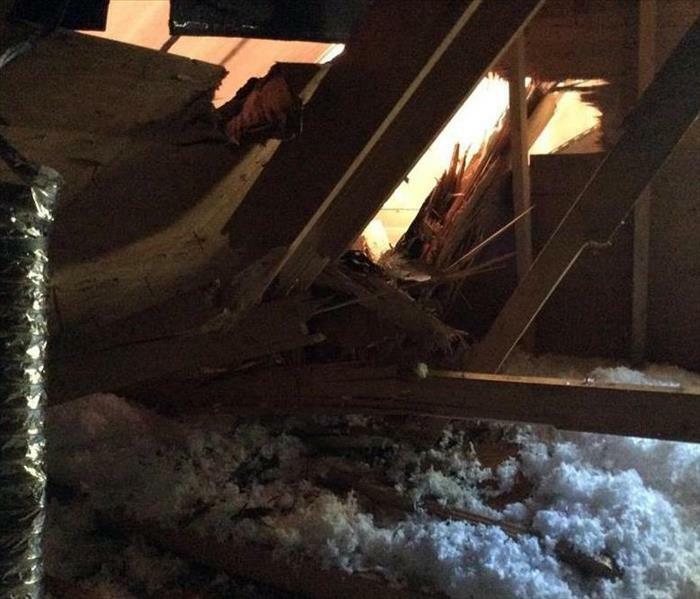 A tree crashing into a roof in a Concord home is never a good thing. Fortunately, no one was hurt and there was no accompanying rain to compound the problem. 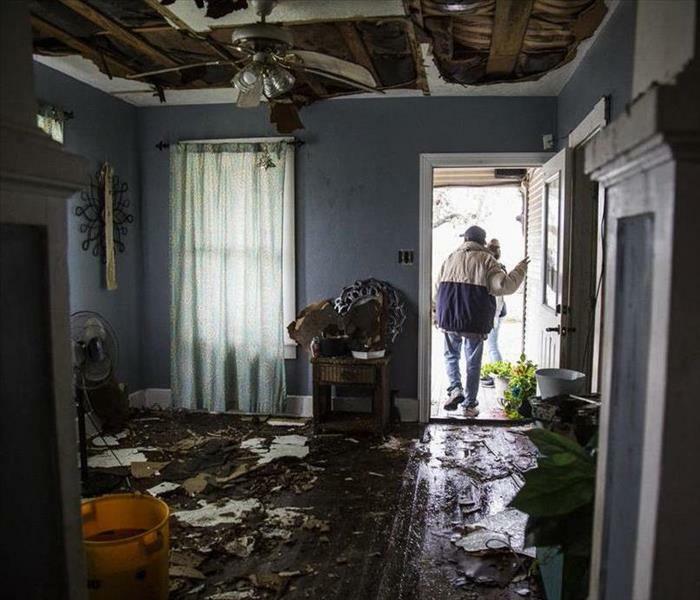 Storm damage can be fixed quick by SERVPRO with a phone call and an immediate response. We can chain-saw the tree away from the roof and close the openings with tarps and plywood until a permanent repair can be done. 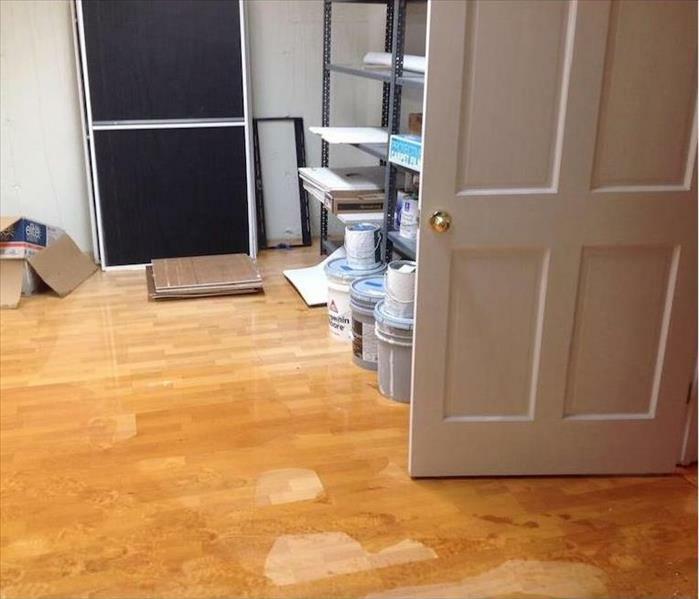 The failed water line drenched the floors in this RE office in Marlborough requiring rapid water removal. 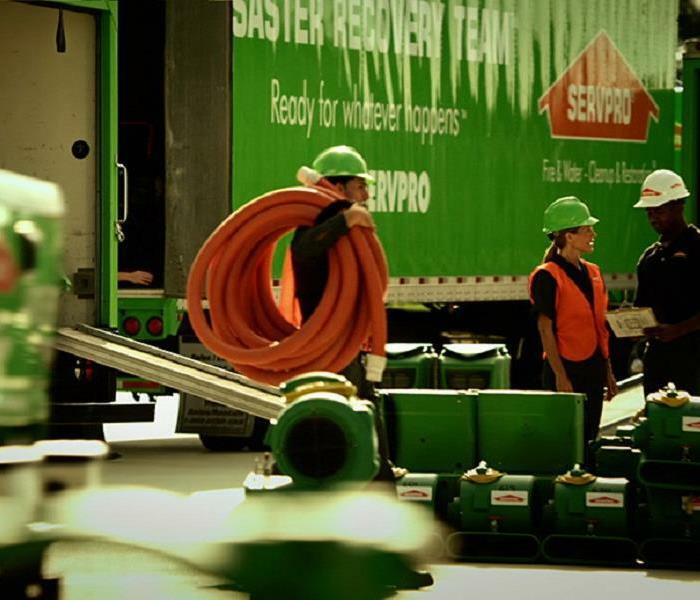 Our SERVPRO water damage technicians used our truck-mounted pump to extract the water and mitigate damages. Next up, air movers and dehumidifiers to complete the service. This is one of the vehicles we use daily to do anything from water extraction, to steam cleaning carpets. Truck mounts play a key role in the effectiveness of our company. If you see one of these on your daily commute, you know it means business! This customer had to have part of his ceiling removed due to water that leaked down from a passed storm. Luckily he called our emergency service line and had the problem taken care of immediately. Naturally, some of our busiest moments happen when a storm occurs. Anything from leaks, to submerged basements. SERVPRO of Marlboro/Concord operates a 24 hour emergency service so you don't get hung out to dry while the water comes flowing in! This customer had damage done to his roof but didn't properly seal it off. A rain storm came and took things from bad to worse, luckily, there's no job too big for SERVPRO of Marlboro/Concord. This customers home was almost completely overtaken by a fire. When our crew arrived, they stepped up to the challenge with open arms. The owner was ecstatic at how effective our team as well as our cleaning solutions were. Since our franchise conception in 1998, SERVPRO of Marlboro/Concord has been a trusted source for the remediation, mitigation, and removal of mold. Our team performed services removing the mold and diminishing any chance it had to spread throughout the home. 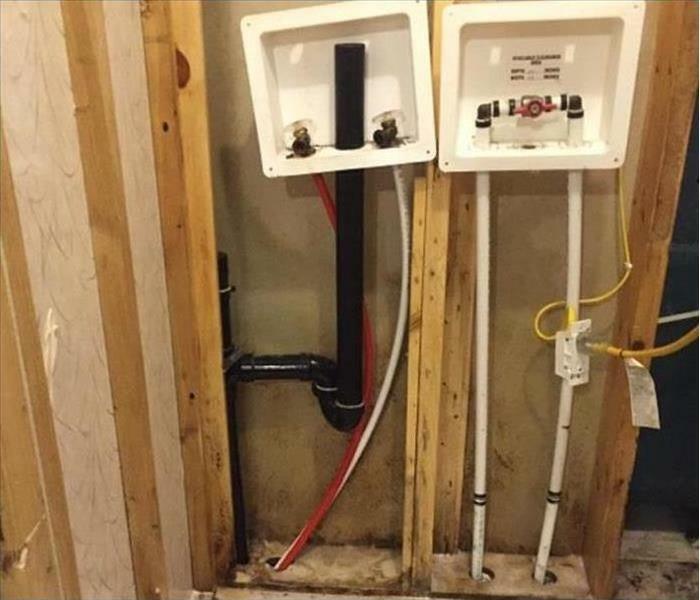 This customer came to his business with the hopes of opening up for the day, only to find three inches of water in his utility room. SERVPRO of Marlboro/Concord got on scene, extracted the water, and immediately started the drying process. 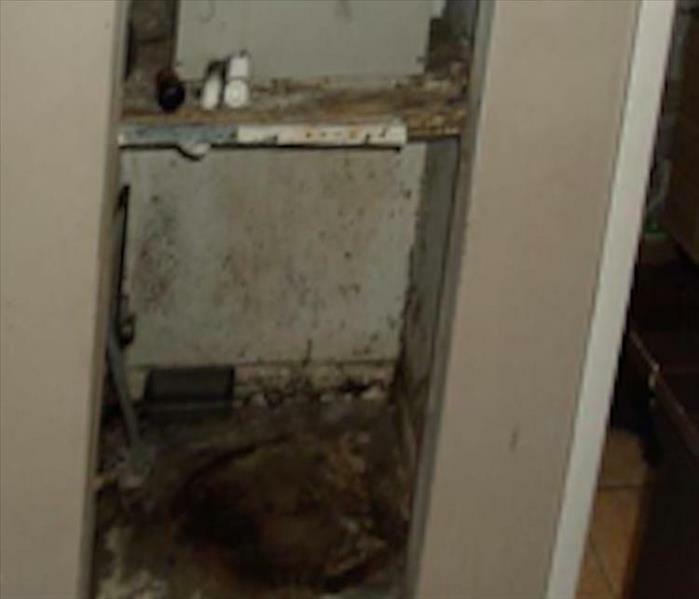 The utility closet in the Concord home was infested with mold from too much moisture. 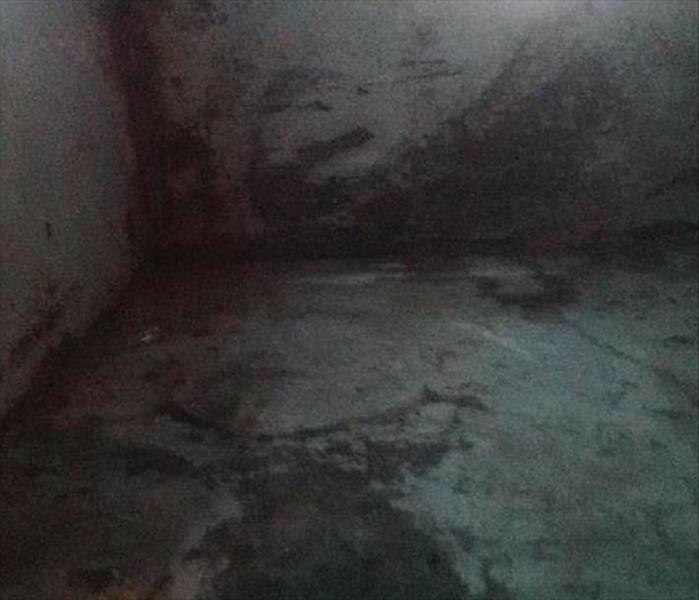 Poor ventilation, along with a water heater or A/C air handler is a recipe for mold growth. Call SERVPRO for help with cleanup and remediation. Fire damage struck this Amherst home when a space heater ignited a fire on a blanket. 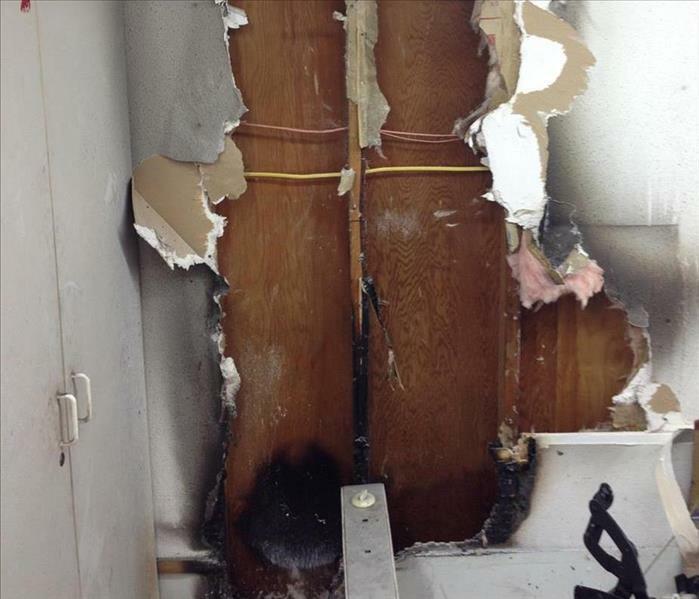 The photo shows the extent of smoke and soot damage that resulted. We used proven SERVPRO compounds to sponge down the walls and ceilings to remove the soot and smoke damage. 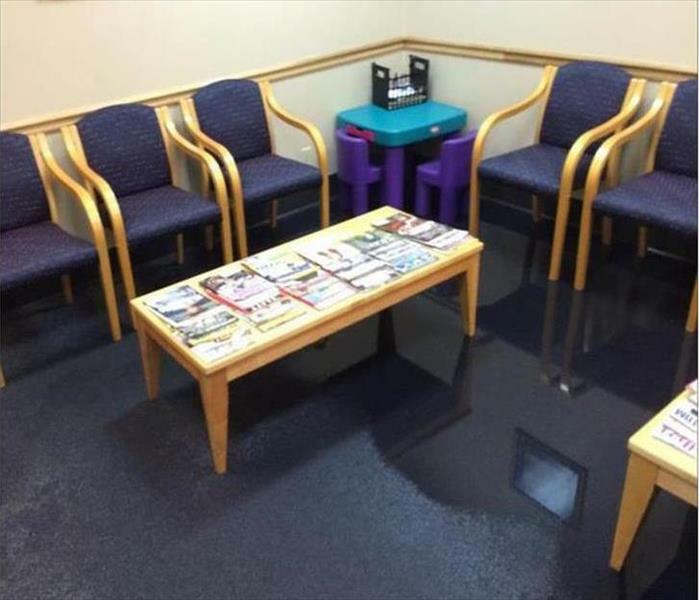 The water leak drenched the carpet of this waiting room in a Concord doctor's office. SERVPRO quickly relocated the furniture to a dry area of the building before proceeding with the water extraction. We used wet-vacs and a "Rover" type riding water extractor. Several air movers and dehumidifiers finished this quick job. By quickly vacuuming up the small amount of water that sprayed down from the sprinkler system, our SERVPRO techs could then set up numerous air movers. Their strategic placement rapidly evaporated the residual moisture with minimal disruption to the guests in the Concord hotel. 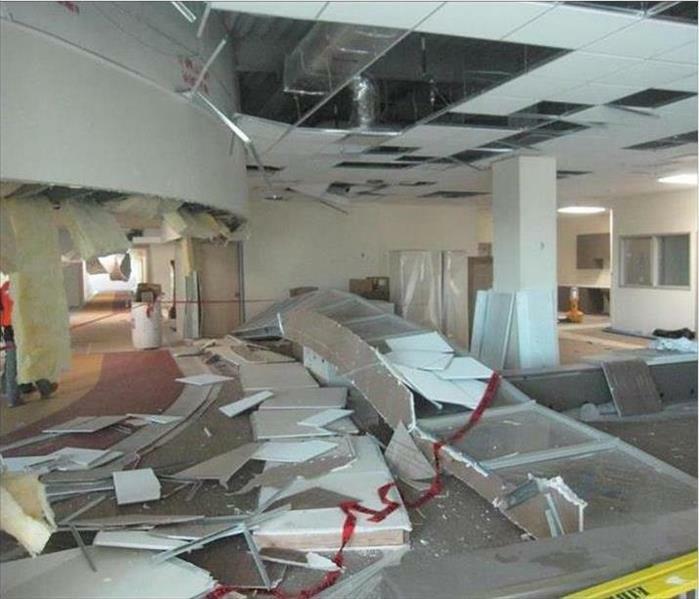 Count on us for commercial water damage issues. 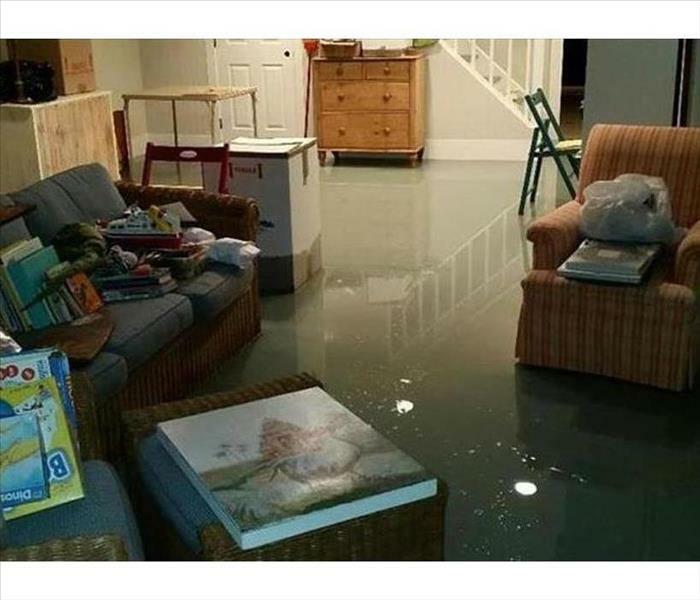 This lower level room in a Marlboro home suffered flooding from water entering from a storm. By rapidly moving the furnishings and belongings to a dry area of the home we can mitigate the water damage. We're Faster To Any Size Disaster. A vacant house in Marlboro illustrates a significant mold infestation. Lack of ventilation and high humidity are two conducive conditions for always present mold spores to proliferate into large mold patches. 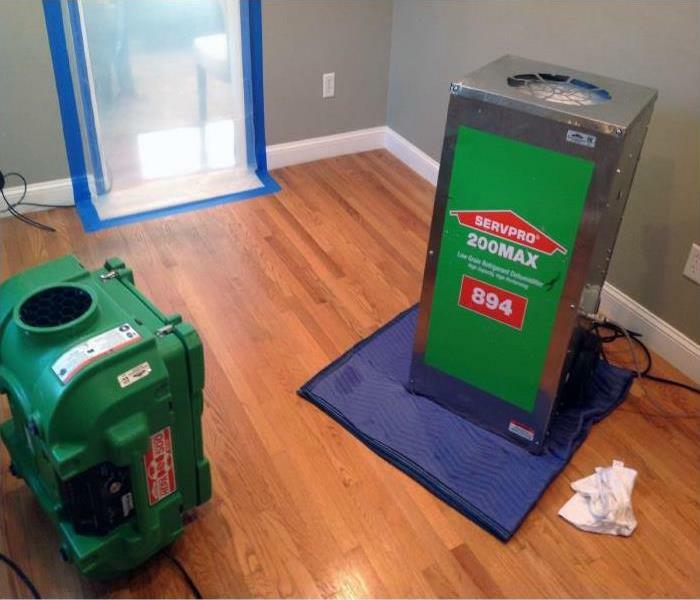 SERVPRO techs use special HEPA-filtered equipment to start the remediation process. Fire damage in Marlboro/Concord can be very ugly as shown in this photo. 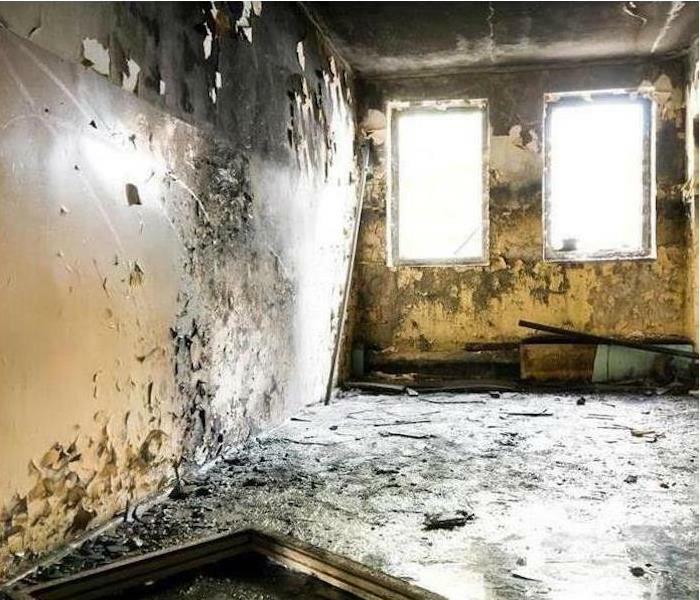 The condition of this fire event underscores the need for professional fire damage restoration with a company such as SERVPRO of Marlboro/Concord. SERVPRO of Marlboro/Concord uses only the very best, highly specialized drying equipment to return your property to its pre-loss condition. We are always ready to serve you at your time of need. 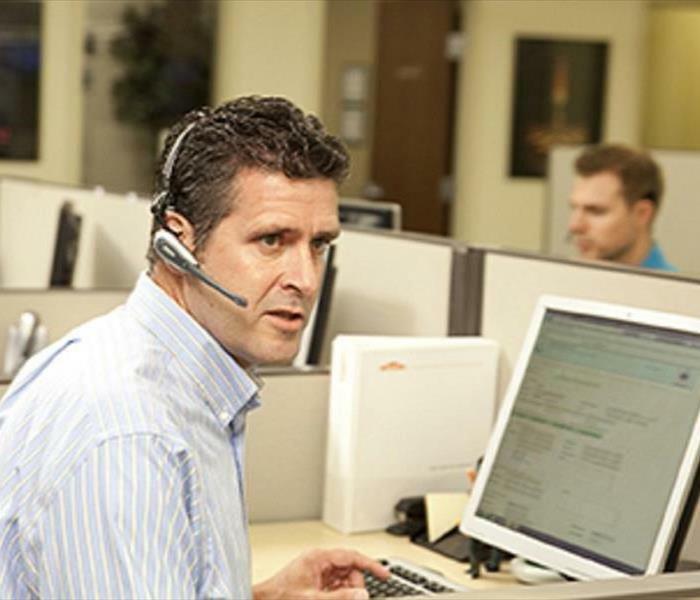 Our office staff is always here to answer your call 24 hours a day 7 days a week. There is no time that is too early or too late for our SERVPRO crew. 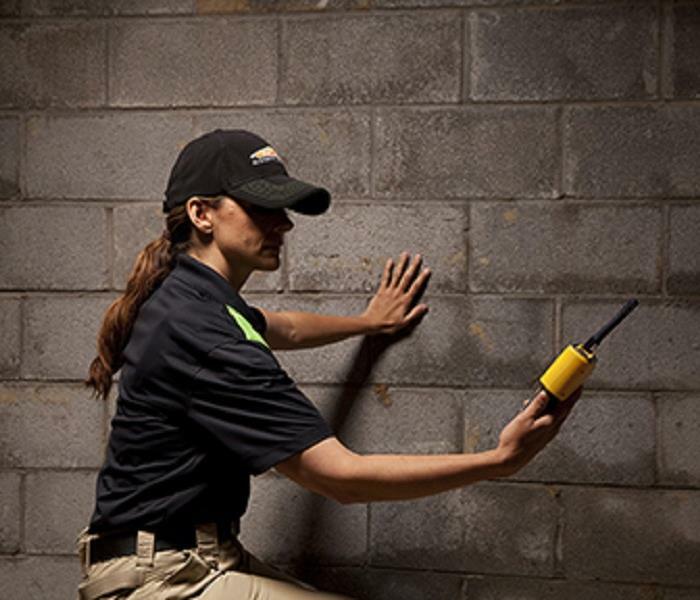 SERVPRO of Marlboro/Concord is committed to the highest level of industry training and detection equipment for our technicians to insure the best possible results for your home or business. "Like it never even happened." Do You Have Soot In Your Home? Did you recently have a fire inside of your residence or business? Did it leave a significant amount of smoke and soot damage? Our SERVPRO crew can make it "Like it never even happened." 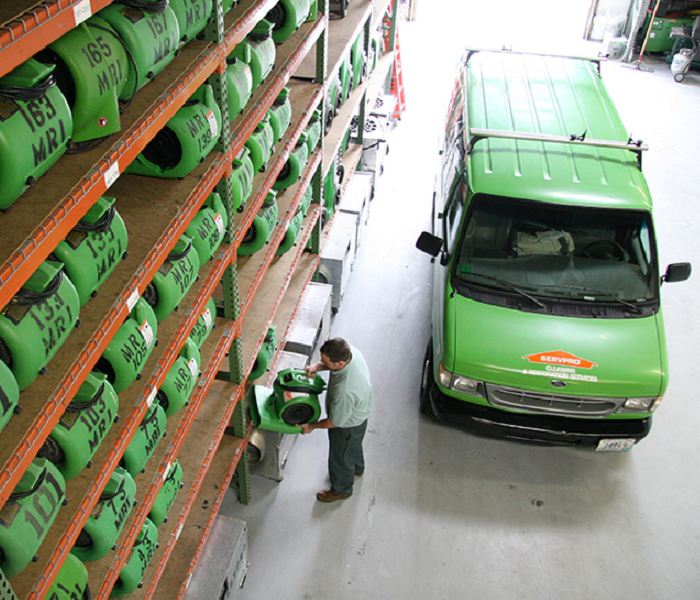 Our SERVPRO crew is always offering the help you need in any type of situation. Fire, Water, and Mold, we live by our motto to the fullest and we want our customers to be 100% satisfied. "Like it never even happened."